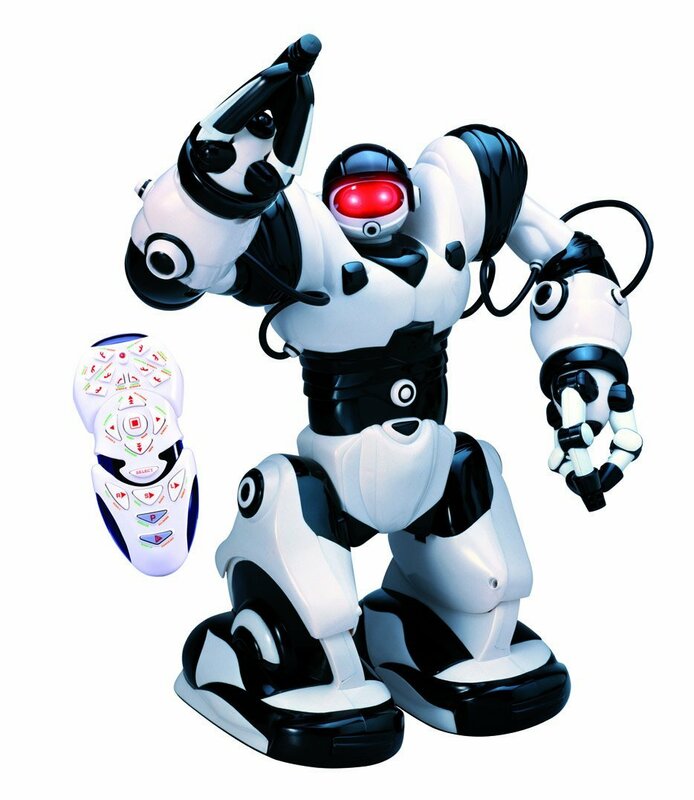 The WowWee Robosapien Humanoid Toy Robot is the much touted design of a NASA physicist and based on what the toy can do, you quickly understand why NASA would need to be involved. Not only does the hulking design put even Cylons to shame, it also comes with over 67 preprogrammed options that includes walking, turning and even speaking. Of course this robot is mainly designed for boys, and some of the preprogrammed options reflect that. This is a robot that can karate chop, burp and give a high five, and it boasts a very sturdy construction which is almost a requirement when boy’s are playing with something. I had heard about the WowWee Robosapein Humanoid Toy for years, but I had never gotten around to trying one of these out. After ordering it online, I soon found the package waiting for me at my front door. After all the positive feedback I had heard about this robot, I was looking forward to trying it out for myself. I decided to immediately unpack the robot, and put it through its paces. Fast forward ten minutes and I was still trying to get it out of its box. I had heard that they were difficult to unpack, and boy they weren’t kidding. Ten more minutes and a controlled demolition later, the robot was out of its box and ready to be inspected. Unfortunately the box was a total loss, and I was lucky that I didn’t have to return it since the box was now a mangled pile of cardboard and plastic. Once it was free from the box, the first thing that stuck me about the robot, was that the paint job really wasn’t really up to snuff for a product in this price range. Mine had several small chips on it, and overall I wasn’t that impressed by the paint. It still looked very good, but I’ve seen better examples in the same price range and you expect something new to be perfect out of the box. Without further ado, I installed the batteries and fired up the robot. The robot started with an “uh huh” and it was off to the proving ground (aka my living room). I first checked out the articulation, and this is where the robot excels. The arms and legs have an impressive range of motion, and the hands come with grips that are capable of picking up items. I then moved on to trying out some of the movements on the WowWee Robosapien. While it functioned nearly perfectly on the hardwood surfaces, it did start to have some problems when it was moved to a carpeted area. This was especially true of its attempts at turning, which I found odd, since it could walk and run relatively easily on the carpet. After running through all of the WowWee Robosapien’s programs, I have to admit that this is a fun robot. I spent the better part of an hour, with it karate chopping, dancing and farting its way across my living room. And with a bit of help, I even managed to successful have it pick up items off of the living room floor. Overall, it was a very satisfying experience and any boy (any many men) would enjoy using this robot. The WowWee Robosapien is a good robot, but it’s not the best in the price range that we’ve reviewed at the Robot Stockpile. The recently reviewed R2D2 Astromech Droid scored slightly higher, and was much more successful at executing its functions, while selling at around the same price point. However, of the two the WowWee Robosapien is more appropriate for younger children, and is a recommended buy if the intended owner is between the ages of 5 to 11 (though the manufacturer states 6 months to 4 years). The WowWee Robosapien’s tough and durable design and locker room humour is perfect for young boys and will hold most kids interest for hours at a time. Click here to read more reviews at Amazon.com . For our Canadian readers, you can find the WowWee Robosapien at Amazon.ca.